The SYNCHRONIC WASTEGATE is a fundamentally new concept that incorporates our patented actuator technology to give you more tunability than you thought was possible with a wastegate. You can produce a minimum of 6 different boost pressures on the same spring, without a boost controller. Our Synchronic WG is the only wastegate on the market that eliminates the diaphragm, gives you the ability to control flow with up to 15 built-in boost settings! Our retail kits give you everything you need to control 4 to 25psi of boost. 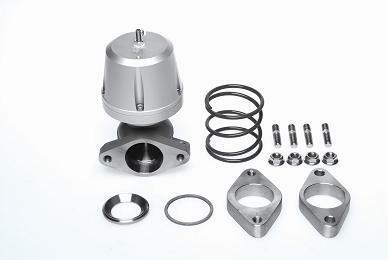 The 40mm Synchronic WG is our smallest frame universal wastegate. It features a 40 mm valve and 2-bolt mounting flange that is a bolt-on replacement to many popular wastegates on the market today. The 50mm Synchronic WG is our large frame universal wastegate with a 50mm valve and V-band mounting flange that is a bolt-on replacement to the popular 44mm wastegates on the market today.